This is a scalable context timeline. 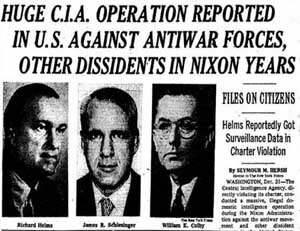 It contains events related to the event July 14, 1970: Nixon Approves ‘Huston Plan’ for Domestic Surveillance. You can narrow or broaden the context of this timeline by adjusting the zoom level. The lower the scale, the more relevant the items on average will be, while the higher the scale, the less relevant the items, on average, will be. Former White House aide Tom Charles Huston, the author of the infamous “Huston Plan” (see July 14, 1970), talks about Watergate and civil liberties with a small audience, the Philadelphia chapter of the conservative organization Young Americans for Freedom (YAF). Plan for Surveillance - His topic is “Government Surveillance of Private Citizens: Necessary or Ominous?” Huston discusses at some length the discussions and issues surrounding his plan, which would have allowed for draconian police and surveillance powers to be used against the populace and particularly against anyone identifying themselves with antiwar protesters and organizations. According to Huston, the country was reeling from bombings and bomb threats, closed-down schools, National Guard alerts, university ROTC buildings being burned, police officers injured and killed, civilians killed, snipers firing from rooftops. 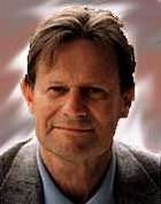 Huston paints a picture of a country on the brink of armed insurrection. Nixon Team Wants Focus Away from Watergate - While Nixon agrees that six hours of interviews will be on the topic of Watergate, his team wants to define “Watergate” as almost anything and everything negative about the Nixon presidency—not just the burglary and the cover-up, but abuses of power at the IRS, CIA, and FBI, Nixon’s tax problems, the Ellsberg break-in (see September 9, 1971), disputed real estate sales, the sale of ambassadorships (see March-April 1972), the enemies list (see June 27, 1973), and the Huston Plan (see July 14, 1970). The hope is that Frost’s focus will become diluted and fail to focus on the Watergate conspiracy itself. 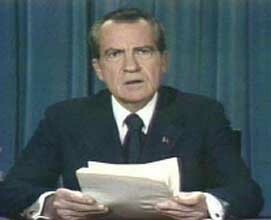 The hope will not be fulfilled (see April 13-15, 1977). 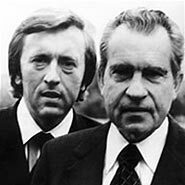 The research team for David Frost, in the midst of marathon interviews with former President Richard Nixon (see Early 1976), has a week to prepare for the upcoming four-hour interview sessions on Watergate (see April 6, 1977). 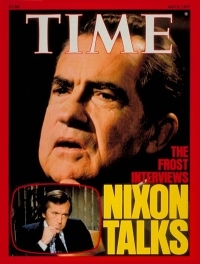 Countering the 'Other Presidents Did It, Too' Defense - Researcher James Reston Jr. tackles Frost’s possible response to what Reston feels will be Nixon’s last line of defense: that what he did was simply another instance in a long line of presidential misconduct. “Nixon nearly persuaded the American people that political crime was normal,” investigative reporter Jack Anderson had told Nixon biographer Fawn Brodie, a line that haunts Reston. Brodie gives Reston a study commissioned by the House Judiciary Committee (see February 6, 1974) and authored primarily by eminent Yale historian C. Vann Woodward, a study examining the history of presidential misdeeds from George Washington through Nixon. The study was never used. Brodie says that Frost should quote the following from Woodward’s introduction to Nixon: “Heretofore, no president has been proved to be the chief coordinator of the crime and misdemeanor charged against his own administration as a deliberate course of conduct or plan. Heretofore, no president has been held to be the chief personal beneficiary of misconduct in his administration or of measures taken to destroy or cover up evidence of it. Heretofore, the malfeasance and misdemeanor have had no confessed ideological purposes, no constitutionally subversive ends. Heretofore, no president has been accused of extensively subverting and secretly using established government agencies to defame or discredit political opponents and critics, to obstruct justice, to conceal misconduct and protect criminals, or to deprive citizens of their rights and liberties. 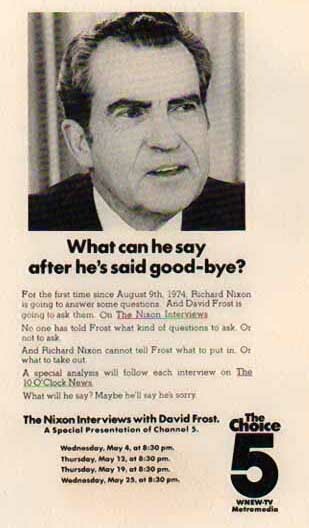 Heretofore, no president had been accused of creating secret investigative units to engage in covert and unlawful activities against private citizens and their rights.” Frost will ultimately not use the quote, but the quote helps Reston and the other researchers steer their course in preparing Frost’s line of questioning.